Marcus Aurelius Nigrinianus, known as Nigrinian to history, was most likely the son of Carinus and Magnia Urbica. He is only known to history through his rare posthumous coinage. It is not known whether or not he died while his father was Emperor or perhaps prior to him assuming the throne. Not much is known about Nigrinian. It is assumed that Carinus’ wife was his mother, but it has been proposed by some scholars who just like to always disagree, that Nigrinian was actually the son of Aurelia Paulina, Carinus’ sister and therefore the Emperor’s nephew. 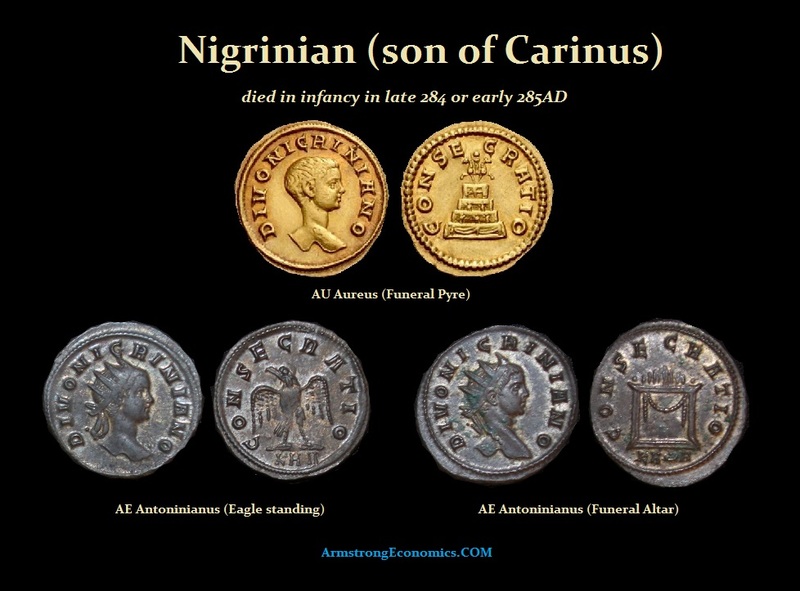 Nigrinian died in infancy in late 284 or early 285. After his death he was given divine status and the coinage issue is reflecting him posthumously.